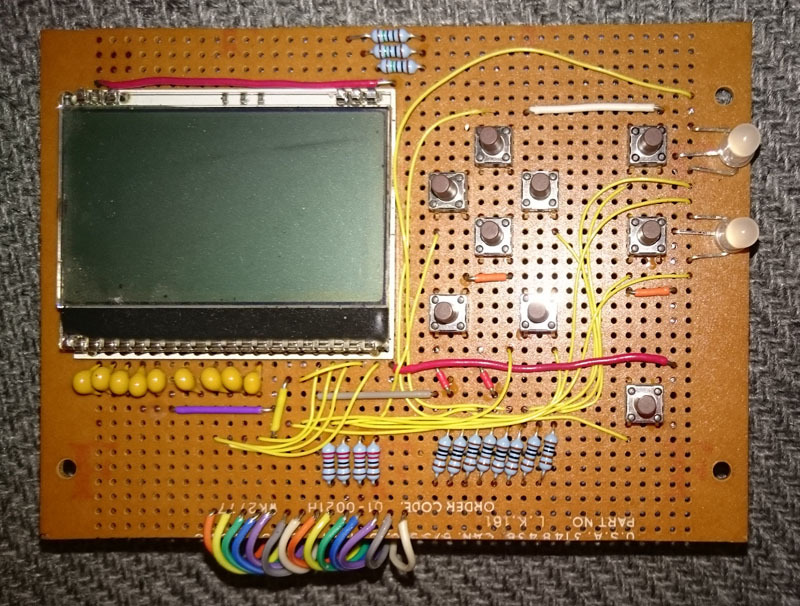 My background is in electronics and computing and, like many others, I have a long list of potential projects to design and build as and when I find the time. One item that was on that list for many years was a trigger to drive a camera and/or flash gun in response to various events. While I managed to complete some projects, the trigger somehow never made it to the top of the list, although I did manage to create an initial list of functions I’d like it to perform. 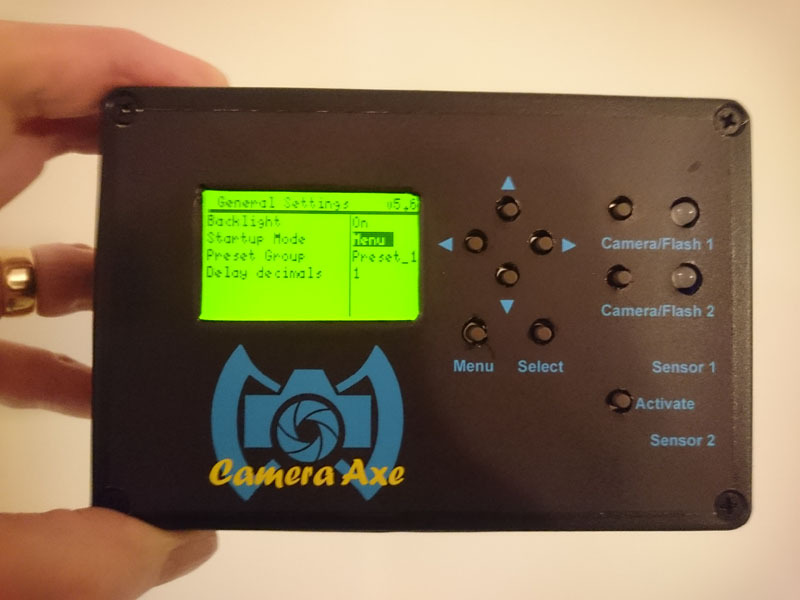 Then, about five years ago, I discovered CameraAxe (www.cameraaxe.com/wp), which is an open source/open hardware design based on Arduino. At the time, CameraAxe was at version 5 and could be bought through the website. 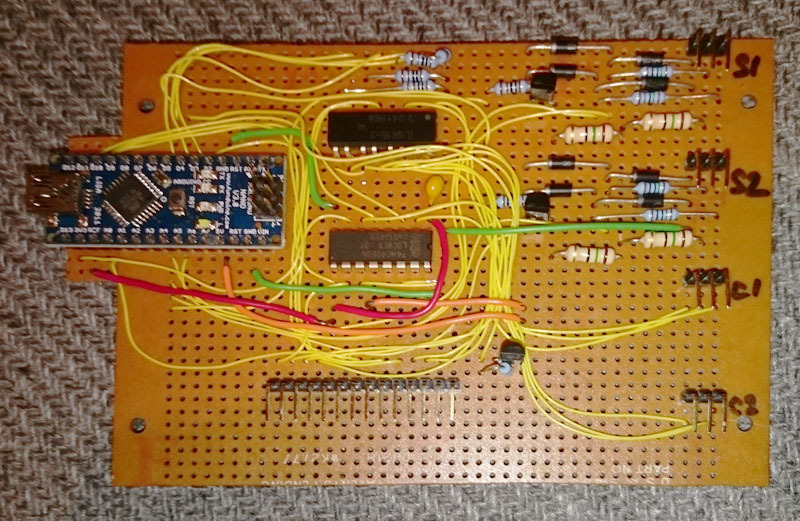 It did most of what I was planning to implement so I built my own veroboard (also known as stripboard) version of the CameraAxe. I actually completed the circuit boards over a year ago and then had to come up with an enclosure to put them in – always my least favourite part of the process. I finally completed the project just before Christmas 2016. These are the two circuit boards (pictures taken with my phone, so apologies for the quality). The processor board is based around an Arduino Nano. Its weird, cantilevered construction is so that the USB port is accessible at the side of the enclosure and also carries the ports for cameras/flashes and sensors. The I/O board holds the display and input buttons along with the indicator LEDs. The two boards aren’t pretty, but they work. Since then, I’ve been doing some testing to make sure the various functions work correctly. CameraAxe can drive a mix of up two cameras or flash guns and has two sensor inputs that are configured by the user to trigger the camera/flash based on whatever the sensor is detecting. The sensor ports can also drive devices such as a stepper motor or a valve (for water drop photography). Because the design is open source, it is possible to design your own sensors and add your own functions to the trigger menus. That’s where I am at the moment… now I just have to find the time to decide what sensors I need and then create them. I hope I’ll manage that in less time than it took me to get to this point.